If you have heard of the animation studio, Illumination Entertainment, then you may have seen some movies, such as The Lorax, Hop, or most notably, Despicable Me. In fact, this animation stupid didn’t even exist more than three years ago…not really. It was founded in 2007, but their first film (Despicable Me) didn’t come out until three years later. At least, that tells you how long this film took to make. We are always a bit paranoid when a new animation studio shows its face…we never know what to think. In fact, it has become basic knowledge that CGI movies are going to have famous people voicing the characters regardless of how good it is…so we just don’t know how it will pan out until we actually see it. There was quite a bit of promotion set forth for Despicable Me, but no one had any idea what it was about…not even remotely. That separated it from the rest of the CGI films nowadays, which was special. How did the film do, though? Steve Carell voices Gru, the biggest criminal mastermind of his time…I had to say that because in a way, this character reminds me of Gene Hackman’s Lex Luthor in Superman. He’s goofy, he’s actually smart, and he just can’t fully get his points across very well. Anyways, Gru is trying to be the biggest villain ever, so his plan is simple: to steal the declaration of indep…moon. Basically, he has to steal a shrink ray, fly into space, shrink the moon, and win title of biggest criminal mastermind of all time. The bank won’t loan him any money unless he gets that shrink ray. In order to make his plan a success, he adopts three girl scouts to innocently and unknowingly help in his diabolical plan. What happens though, when the girls remind him of what it’s like to feel loved? There’s one thing that you’re just going to automatically assume when going in to see an animated film like this…it’s going to be coming-of-age. Most kids movies are, because those kids need to be told life lessons in an appealing light…it makes sense…it all just depends on how that is done. This time, it is done quite brilliantly, actually. Usually coming-of-age flicks have almost no plot, but this one had a clear plot. Gru was facing off against arch rival Vector, trying to get that moon, and trying to ultimately win that title. The girls weren’t trying to grow up as much as they were searching to be wanted. The only character that had some growing to do here was obviously Gru. It’s something when kids learn certain life lessons in order to become adults…it’s something else entirely for an adult to learn kid lessons in order to remember how it is to be a kid again. Can you really call that coming-of-age? It’s a step under your typical child if you think about it. Villain (grows up to be) child (grows up to be) adult. When you think of it that way, you start to realize that there really isn’t so many stories that are like that when you initially think there would be. Nothing immediately comes to mind. That’s one thing this film had special. Another thing that many would say this film had that was special was…the minions. How many of you have seen teasers for Despicable Me 2 where there just seems to be too much focus on those minions? I mean, out of all of the posters released, there was only one that had Gru on it, while all the rest had exclusively minions. They were nice in the first one, the added a separate element to the film. Added humor, added a feel…it was nice, they complimented Gru nicely. So here’s what I have to say…do not, under any circumstance, allow them to say GRU compliments THE MINIONS. They are coming dangerously close to doing the same thing Cars 2 did by changing the main character. Not a good idea. Heck…even after Despicable Me 2, a third film in the universe is slated, titled Minions. NO. I think they’re funny to the series, but should not be given as much focus as they have been increasingly gotten. That’s just my opinion…but they better not botch this up. Anywho, Despicable Me 2 comes to theaters during this Fourth of July holiday. Now’s a good time to catch up on the original! I really hope they don’t make the minions the focus… That was part of their magic: they had just enough presence to be hilarious, but they weren’t overdone. Right, and then they stirred up the kiddoes, and apparently entertaining kids is starting to be their primary focus…when it really should be story. Kids don’t know how to say it accurately, but the story does affect them too. Good review Dave. A bit too kiddie for me, but it was okay that I think the sequel will be fine enough for a watch. 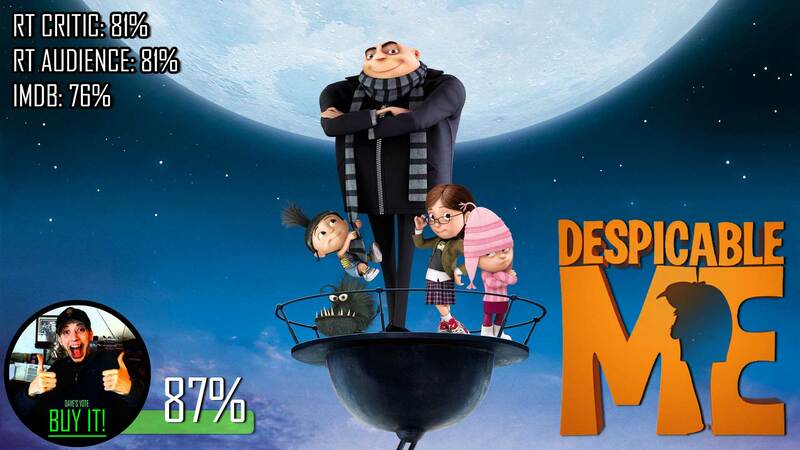 I would rate it a 98% because I thought the film was just a little bit slow when Gru was actually a BAD guy, especially to his girls, but when he discovers that he has loving connection to his girls, I thought that’s when it got fantastic!!! Well I’m glad I didn’t give it under 80% then haha. No, it’s a wonderful tale, especially or single fathers. A subject I know a bit about.